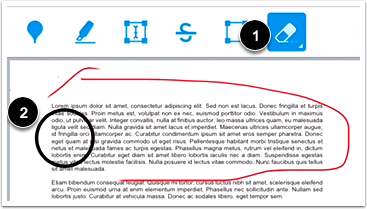 How do I add DocViewer annotations in the Teacher app on my iOS device? When viewing assignment submissions, you may be able to add annotated comments in the submission. 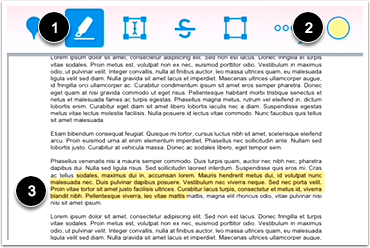 Canvas DocViewer is a tool that allows annotations in online assignment submissions. Annotations made in Canvas Teacher sync with SpeedGrader in the web version of Canvas. If a student submits a file that is not compatible with DocViewer, the document previewer will still display the file, but DocViewer markup and commenting will not be available. When you open a submission, DocViewer will automatically save any annotations made to the submission file for one hour. You can restart a DocViewer session at any time by refreshing the submission page. Files over 100 MB and password-protected files will not be converted by DocViewer. SpeedGrader may take up to ten minutes after an assignment is submitted to display a document that supports DocViewer. 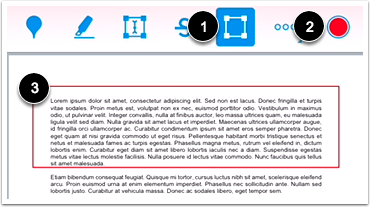 Files that are compatible with DocViewer display the DocViewer Toolbar at the top of the document and includes six different annotation types. 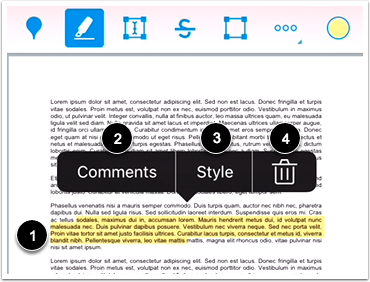 Select an annotation tool by tapping the annotation icon . When selected, the icon will include a white background. To no longer use an annotation tool, tap the annotation icon again. 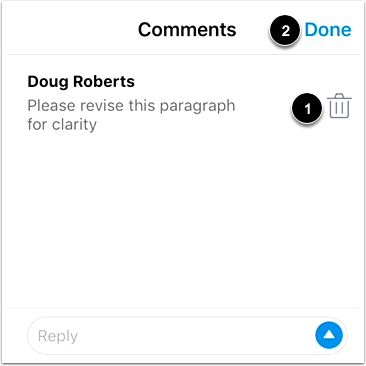 While adding an annotation or comment, you can undo or redo the last action made in the submission by tapping the More Options icon . If a submission includes more than one page, view the additional pages by swiping up your screen. To leave a point annotation, tap the Point icon . To select a color for the point annotation, tap the Color icon . Tap the area where you want to add the annotation . Point annotations immediately require a comment. In the Reply field , type the comment for the point annotation. Tap the Send icon . To delete your comment, tap the Delete icon . To return to the submission, tap the Done link . 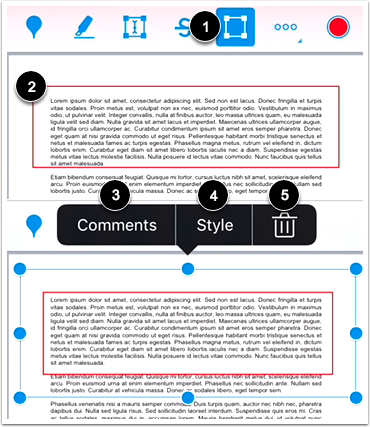 To move the annotation, tap and hold the annotation icon in the document . Drag the annotation to the new area. To view and modify your annotation comment, tap the Comments link . You can also use this link to view and reply to any student comments made in DocViewer. To change the color of the point annotation, tap the Style link . To delete the annotation, tap the Delete icon . Deleting an annotation will also delete any associated comments immediately. 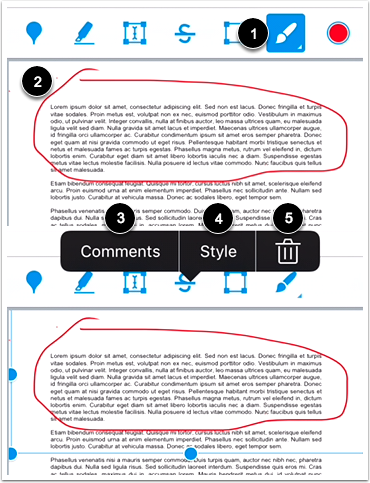 To highlight text within the document, tap the Highlight icon . To select a color for the highlight annotation, tap the Color icon . Then tap and drag to highlight text within the submission . To modify the annotation, tap and hold the annotation . To add a comment to the highlight annotation, tap the Comments link . You can also use this link to view and reply to any student comments made in DocViewer. To change the color of the highlight annotation, tap the Style link . To delete a highlight annotation, tap the Delete icon . Deleting an annotation will also delete any associated comments immediately. To add text directly in the submission, tap the Free Text icon . 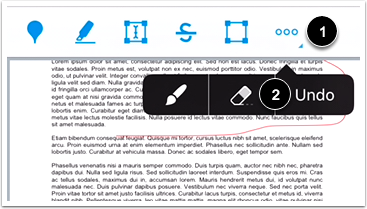 To select a color for the text annotation, tap the Color icon . In the text field , enter the text you want to add for the annotation. To change the size of the text, tap the point link . When you are done, tap the Done link . 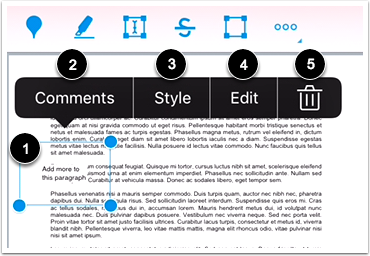 To modify the annotation, tap the annotation text box . 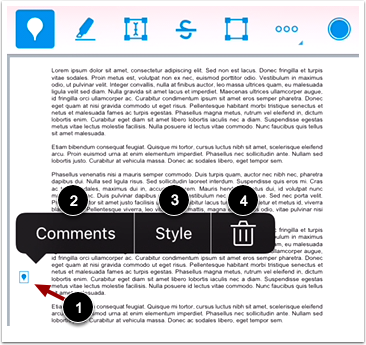 To move the annotation, tap and hold the annotation outline in the document. Drag the annotation to the new area. To add a comment to the text annotation, tap the Comments link . You can also use this link to view and reply to any student comments made in DocViewer. To change the text size or color, tap the Style link . To edit the annotated text, tap the Edit link . To delete a text annotation, tap the Delete icon . Deleting an annotation will also delete any associated comments immediately. To indicate that text should be deleted, tap the Strikeout icon . To select a color for the strikeout annotation, tap the Color icon . Tap and drag to strikeout text within the submission. A line will appear indicating the text has been struck out . To modify the annotation, tap the annotation . To change the strikeout color, tap the Style link . To delete a strikeout annotation, tap the Delete icon . Deleting an annotation will also delete any associated comments. To leave an area annotation, tap the Area icon . To select a color for the area annotation, tap the Color icon . Tap and drag the rectangle around an area of the submission . A box will appear indicating the area for the annotation. To modify the annotation, deselect the annotation type . 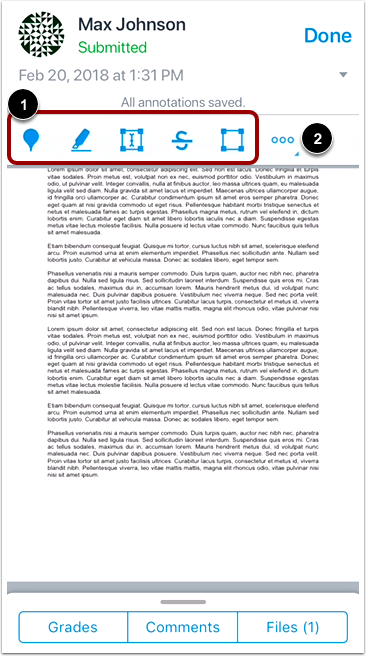 Tap the annotation icon in the document . 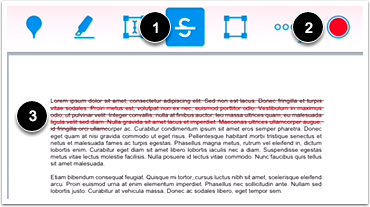 A blue outline will display around the annotation area. 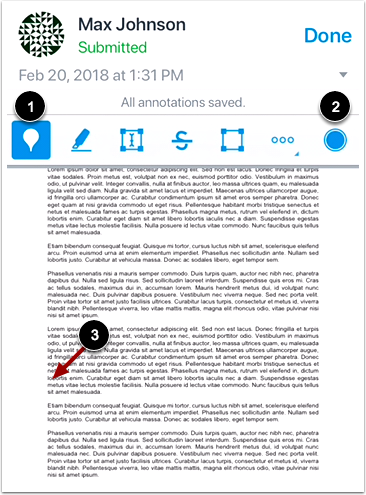 To move the annotation, tap and hold the area annotation outline in the document. Drag the annotation to the new area. To add a comment to the area annotation, tap the Comments link . You can also use this link to view and reply to any student comments made in DocViewer. To change the color for the annotation, tap the Style link . To delete the annotation, tap the Delete icon . Deleting an annotation will also delete any associated comments. To make freehand drawings and annotations, tap the Draw icon . To select a color for the draw annotation, tap the Color icon . Tap and drag to start a drawing. Free-form lines will appear indicating the drawing area . You can add multiple strokes to a drawn annotation. Note: You may have to tap the Options icon to view the Draw tool. To modify the annotation, ensure the annotation type is not selected . Then tap the annotation . 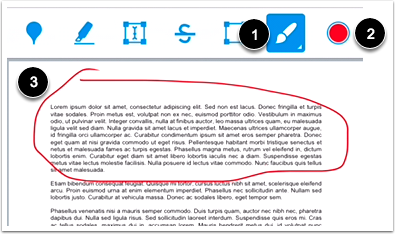 A blue outline will display around the annotation drawing. 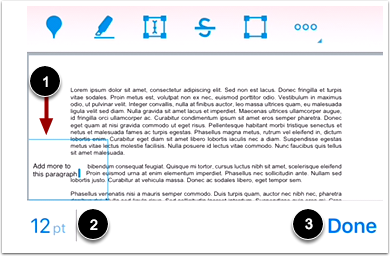 To move the annotation, tap and hold the draw annotation outline in the document. Drag the annotation to the new area. To add a comment to the drawing annotation, tap the Comments link . You can also use this link to view and reply to any student comments made in DocViewer. To erase your drawing annotation, tap the Erase icon . Then tap and hold your screen to use the eraser tool . The Eraser tool can only be used to erase drawing annotations. You may have to tap the Options icon to view the Eraser tool. To undo the most recent annotation, tap the Options icon . Then select the Undo link . Previous Topic:How do I grade an assignment submission in the Teacher app on my iOS device? Next Topic:How do I add a comment to an assignment submission in the Teacher app on my iOS device? 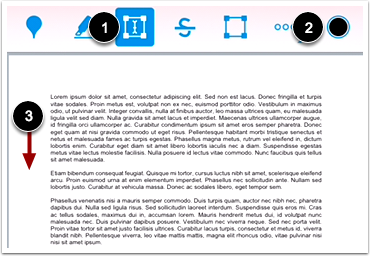 Table of Contents > Courses > How do I add DocViewer annotations in the Teacher app on my iOS device?